Sometimes when you’re making dinner, you just make too much. This is the case when I made the Sous Vide Country Style Pork Ribs with Dijon Sauce last week. We had enough for dinner. And, lunch the next day. And, we still had half of the lot left. What to do? Well, the base for a delicious bean is a delicious pork. 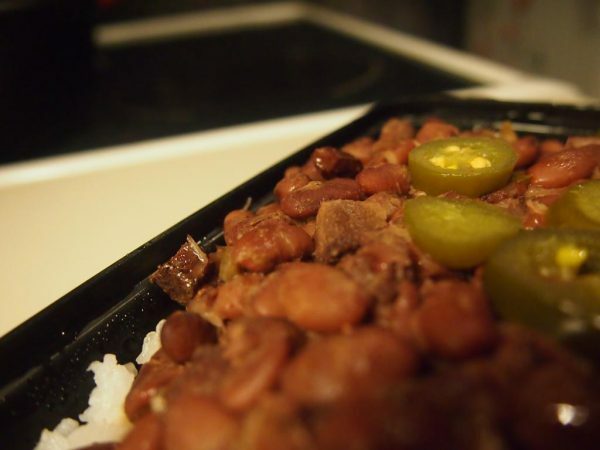 Since I happen to have a large cache of delicious pork, a dish of red beans and rice was sounding pretty danged nice. Also, beans and rice is one of my favorite things in life. With my handy new pressure cooker in hand, I started with this popular recipe on AllRecipes: Pressure Cooker Red Beans and Sausage. The major alteration: use the leftover pork, not store-bought sausage, and use some smokey chipotle chili. Heat vegetable oil in skillet over medium high. Cook for until slightly softened. Place into pressure cooker. Place beans, pork, seasonings (bay leaf through cumin), and water into pressure cooker. Stir to combine. Seal lid and bring pot to full pressure over high heat. Reduce heat to low, maintaining full pressure, and cook for 30 - 45 minutes. Allow pressure to drop naturally. Cook rice according to your preference. Serve with jalapeño slices, and (this is important) about 1 - 2 teaspoons of the liquid from the jar. The original recipe called for 30 minutes in the pressure cooker. But, they weren't done yet, so I put them in for another 15 minutes.